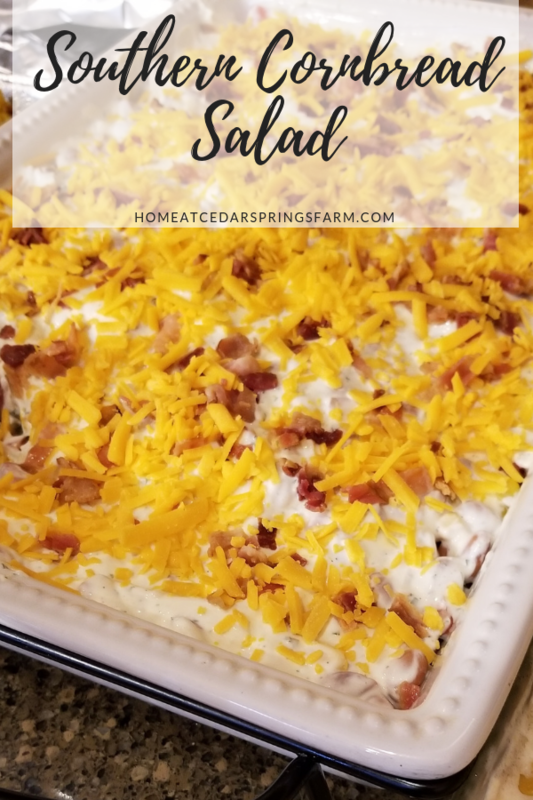 A crowd pleasing layered salad with bacon, cheese, and cornbread that comes together easily for all of your gatherings. Perfect for any time of the year. 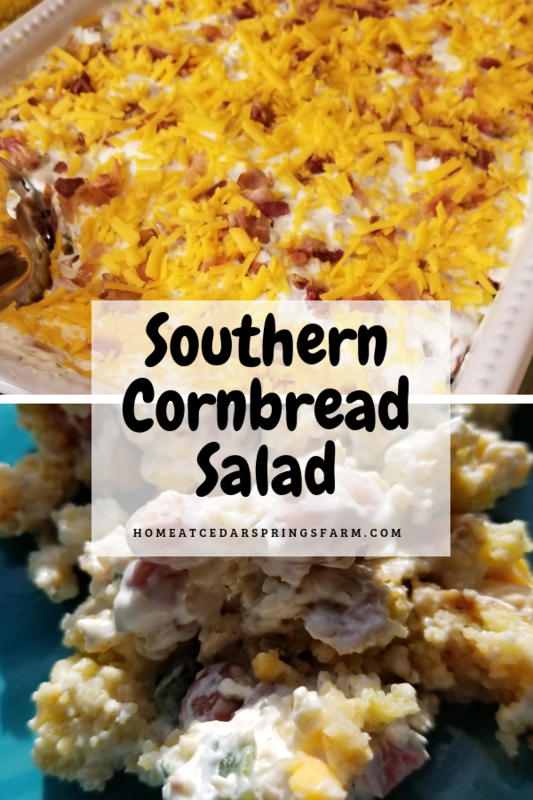 Have you heard of Cornbread Salad? If you answered no, then you are missing out. My sister has been making this recipe for years, and she is in charge of making it for every get-together. This salad is fantastic. Once you taste it, you will see exactly what I mean. Your family will request it at every get-together, potluck, or cookout. I know my family does! 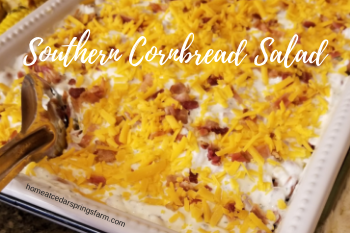 Cornbread, pinto beans, corn, tomatoes, peppers, onion, cheese, and bacon are layered in a casserole dish with ranch-flavored sour cream and mayonnaise. Really?? If it has ranch dressing in it, then it must be good! I love all of the layers in this salad, and it’s easy to customize to your preferences. Just add or subtract ingredients according to what you like and dislike. Just make sure you add the dressing mixture in the middle of the salad and on top so that everyone gets a taste of that delicious ranch flavored dressing. This salad is made with homemade cornbread. You could certainly prep all of the ingredients the day before and refrigerate until you are ready to prepare your salad. This would make the salad come together faster and save you some time. It can be eaten immediately, but it is better if you can refrigerate it for a few hours before serving. Cornbread Salad could be served as a meal, but at my house, it is served as a side dish. You can serve it all mixed up or keep it in layers. I bet your family will be requesting this salad as much as mine does! If you love roasted vegetables, try my Pan Roasted Vegetables. Combine salad dressing mix, sour cream and mayonnaise. Stir well. Set aside. Chop tomatoes, bell peppers, and onion. Set aside. In a deep bowl or casserole dish (13" x 9"), place half of the crumbled cornbread in the bottom of the dish. Top with half of each: beans, corn, tomatoes, bell pepper, onion, salad dressing mix, cheese and bacon. Repeat layers using the rest of the ingredients ending with cheese and bacon. Oh this looks so good! I never would have thought of this but it looks delicious! Going to save this to make!! This sounds SO delicious! I need to get the ingredients so I can make this. I think this is something the whole family would enjoy! Let me know what your family thinks about this dish. I hope they enjoy it as much as my family does. Looks great. I love dishes that can be made in advance of a gathering! Yes, this is the dish my family loves and we all look forward to my sister bringing this to all of our gatherings. This looks really good, it sounds like a great comfort food for this cold season, thank you for sharing. Hey, Gina – I’m going to try this for New Year’s day. Do you make traditional, from scratch cornbread or can the boxed mix be used? I usually make my cornbread from scratch. I am sure a boxed mix will work just fine. Let me know what you think about it. Happy New Year!